The MAS page is geared toward the information most of interest to the membership. But visitors are welcome here as well! Our next meeting will be on April 19th at the Observatory at 8PM. The Board meets at 7PM. Our first Open House "night" of the season will be on June 22nd. We will need your help! None currently scheduled, but check the Google Group for announcements. We now have a brand new F-Scope, a Stellarvue SVQ100 F5.8 Astrograph to replace the C14. And a new imaging camera, a ZWO ASI1600MM Cool. The mount is an AP GTO900. It sits in the Toeller Observatory. Currently it's being tested and should be in operation within the next few months. We have seen great progress with the G-Scope which sits in the Z-Dome. The new AP GTO1600 is now mounted on top of the new bridge, telescope mounted, and we're starting to image. Night Sky Network recognizes the MAS. 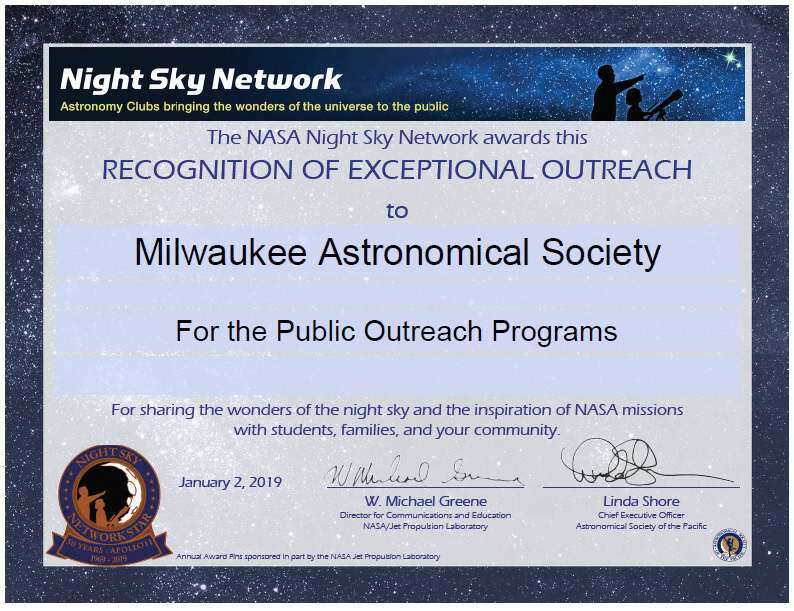 The Night Sky Network awarded the Milwaukee Astronomical Society it's Recognition of Exceptional Outreach for our programs of open houses, tours, and public presentations. January 2 Wed Event: Note - No First Wednesday Meeting in January!